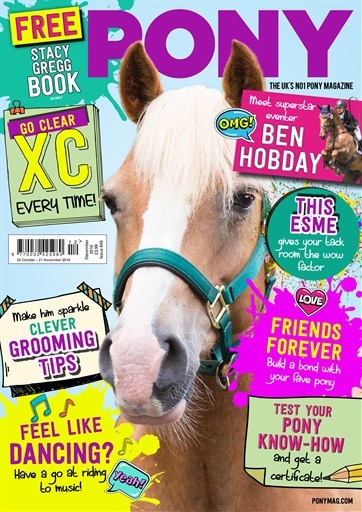 December PONY is here and it’s packed with super-fun things to read and brilliant ways to improve your riding and horsey knowledge! Super-star rider Ben Hobday has taken time out of his busy schedule to answer readers’ questions about his life in eventing. Find out which event is his absolute fave and what’s the scariest fence he’s ever jumped! Plus, if you want to follow in Ben’s footsteps and be a top event rider, check out our tips for acing scary cross-country fences, from ditches to corners. If your yard is looking a bit messy, YouTuber ThisEsme comes to the rescue and shares her brilliant ideas for organising your tack and feed rooms. We also share some amazing tips that’ll make grooming your fave pony soooo much easier this winter, and find out how you can build an even stronger bond with him. Test your horsey knowledge in the PONY Academy, and send in your answers to receive a certificate! Plus, Don’t miss our amazing competitions to win Mini-Jumps and Sweetbriars’ books – Download your copy today!